This morning raga, Bairagi, has been chosen to balance increased Kapha. The firm, very clear tones of the sarod make it a suitable instrument for enlivening the mind and body. The sarod is made from teakwood, has goat skin stretched over the sound box and a hollow neck covered with metal. It has 25 strings. 4 are for the playing the melody and 15 are resonance strings. The sarod has no frets and the notes are played by pressing the fingernails onto the metal plate. Meends, the important musical gliding tones, are achieved by the musician sliding his fingernails up and down the vibrating string. The sarod is played using a coconut shell plectrum and is the loudest of any Indian stringed instrument. Bairagi, as it is mainly played, has the quality of an early, quiet, somewhat heavy morning and gives a feeling of solitude and melancholy. The second note kamal rishab (flattened Re) is lowered even more to reflect the solitude and heaviness of early morning just before sunrise. Alap is the meditative part of the raga, where the notes are introduced. In this recording it is kept short and quickly changes into the rhythmical, faster parts of jod and jhala. Tejendra Narayan Majumdar plays the phrases clearly and precisely in quick succession, leaving no room for a restful or contemplative feeling. Kamal Rishab is strongly lowered giving it the quality of the very early morning hours. The playing technique, however, is rather cheerful and lively, which is very refreshing and gives energy and strength for the approaching day. The gat (main part of the raga) starts with tin taal (a cycle of 16 beats) in vilambit (slow speed) which is divided as follows: dha dhin dhin dha | dha dhin dhin dha | dha tin tin ta | ta dhin dhin dha (16 beats of 4 + 4 + 4 + 4). Here Subhankar Banerjee starts with a tabla solo, which can be compared to an aperitif before the meal of the very invigorating interplay of sarod and tabla. The drut, or fast gat, follows in Sitarkhani, which is also a cycle of 16 beats but the division is: dha -dhi -ka dha | dha -dhi -ka dha | dha -ti -ka tha | ta -dhi -ka dha (16 beats of 4 + 4 + 4 + 4). Since the kamal rishab is more flattened in the short alap, but played normally in the gat, this recording of raga Bairagi can be heard throughout the whole of the Kapha time in the morning from 6 a.m. to 10 a.m. Alap, jod and jhala can be heard from approx. 5.30 a.m. The alap is a beautiful entry into the exhilarating and stimulating parts of the raga and offers a period of grace to prevent driving away the heaviness of the Kapha period too quickly. The fast, melodic crescendo (jhala) then foils any attempt by Kapha types to close the eyes and continue dozing. The firey playing of Subhankar Banerjee on the tabla, the most common percussion instrument, enlivens mind and body simultaneously and the ease with which the rhythmical patterns are played dispels any feelings of lethargy. 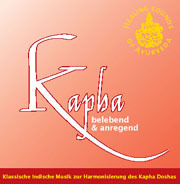 The phrases and taal can be fully expressed, unlike the recordings for reducing Vata and Pitta, since joy and enthusiasm for rhythmical finess or skilfull musical presentation of feelings are beneficial for reducing Kapha. The spring raga, Basant, is also dynamic but softer. It is played in the evening hours from approx. 6:30 p.m. until 9:30 p.m. and can be played at every time of day in spring. It depicts a young man and a young woman who meet with love and joy. The joy of spring finds expression in this raga as well as the nourishing and fortifying qualities of this season. A short alap is followed by the gat in Drut Ek Taal (cycle of 12 beats in fast tempo). The Ek Taal is divided as follows: dhin dhin | dhage terekete | tun na | kat ta | dhage terekete | dhin na (12 beats of 2 + 2 + 2 + 2 + 2 + 2). In contrast to the enlivening and stimulating raga Bairagi, which is played in the early morning Kapha period and acts as a "wake-up" call, raga Basant is more energetic and revitalising. It takes into account the need to settle down in the evening and, at the same time, gives sufficient energy to enjoy the evening's activities. Because of its revitalising quality, it should not be listened to directly before going to sleep. Tejendra Narayan Majumdar was born in Kolkata in 1961. Even as a child, with the help of his father, he was deeply interested in playing the sarod. When his important talent became apparent, Ustad Bahadur Khan accepted him as a student and carefully taught him until 1989, the year Khan died. Tejendra Narayan Majumdar continued his studies with the legendary maestro, Ustad Ali Akbar Khan, whose name is synonymous with the sarod. Because of his virtuosity and ability to interprate ragas, Tejendra Narayan Majumdar is regarded as the best sarod player of his generation today. He masters his instrument with unbelievable sensitivity, which enables him to play this exhilarating and stimulating music in a way that inspires one to get up rather than being shaken awake. Subhankar Banerjee has been a pupil of Swapan Shiva since he was five years old. Swapan Shiva is a celebrated artist and teacher of the Farukhabad Gharana (one of the classical tabla schools). Over the years, however, Subhankar Banerjee also taken every opportunity to study the art of other tabla schools and, moreover, has taken vocal lessons, which has made him one of the most booked tabla players for recordings and appearances. His fiery and energetic playing, controlled with great virtuosity, made him the first choice for this recording.